Police investigating after a woman reported she was raped said they now believed the attack did not take place. 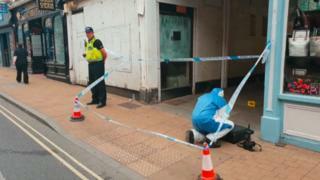 The incident was said to have taken place in Ipswich, in an alleyway off Upper Brook Street, on 12 August. Suffolk Police said CCTV footage was reviewed, witnesses were interviewed and officers "spoke at length" to the woman who reported the crime. The force said it had reassured the woman, aged in her 20s, "no crime took place as reported in this location". A spokesman said police would like to "reiterate all reports of this type are taken very seriously and thoroughly investigated". Officers say they are continuing to work with the woman who made contact with them.